Sizzix have been the leader in die cutting for paper crafting for many years. Now that they are producing dies specifically designed for patchwork the Big Shot offers big benefits in speed and accuracy for anyone who works with fabric. At the heart of the Sizzix Die Cutting system is the Sizzix Big Shot. You place fabric between a Sizzix sandwich with your chosen die shape and two plastic pads forming the ends of the sandwich. You then roll this through the Big Shot and your fabric is cut out to the shape of the die. You can cut multiple layers of fabric at any one time. 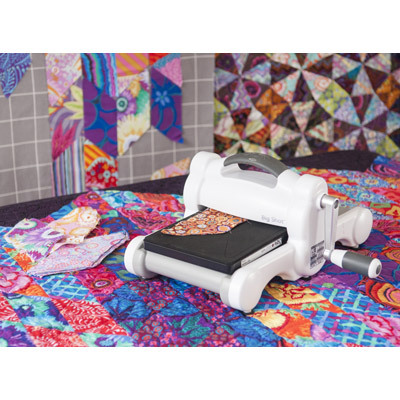 As well as patchwork blocks such as triangles, hexagons, squares and circles you can also use the Sizzix Big Shot to cut out applique shapes. The Sizzix Big Shot is a compact machine at 14-1/4" x 12-3/8" x 6- 5/8" and quite portable, weighing 3.4kg (7-1/2lbs). It can be used to cut Bigz, Bigz L and Bigz XL dies so it is perfect for most patchworker’s needs. As well as the Big Shot Sizzix also produce a die cutting machine called the Big Shot Plus which has an A4 bed so that it can take A4 sheets without cutting them first, it also has a range of Bigz Plus Dies that fit it. You can try out the Sizzix Big Shots in our shop, just ask our staff for a demonstration. We also demonstrate the Sizzix Big Shot machines at shows that we attend. We have a comprehensive range of Sizzix dies in the shop and demonstration machines that you can try out to see how easy it is. You can browse our full range of Sizzix machines, dies and accessories in our online store. Sizzix patchwork dies cut out regular geometric shapes such as triangles, squares and rectangles which then form patchwork blocks when stitched or pieced together. By using the accurate Sizzix dies you can get lots of regular sized shapes very quickly. Probably far more quickly and more accurately than if you used traditional rotary cutters and rulers. With the Sizzix applique dies you can cut out out complex shapes such as flowers, animals or letters and incorporate them in your patchwork designs. You can then either applique using a whipstitch for example or if you have included a fusible in your 'Sizzix sandwich' then yoiu can simply fuse the cut out shape to your project. For further information and to show the possibilites of the Sizzix fabric cutting system we have created a Sizzix e-brochure that contains information on the Sizzix Big Shot and Bigz dies and how they are used.